An ambulance crashed after the driver fell asleep. BURLINGTON, N.C. (WTVD) -- A Burlington street was closed after an EMS truck driver fell asleep and crashed into a concrete retaining wall Saturday morning. Authorities said it happened just before 6:30 a.m. in the 2700 block of McKinney Street when the driver collided with the curb, traveled 70 feet and hit a concrete retaining wall. 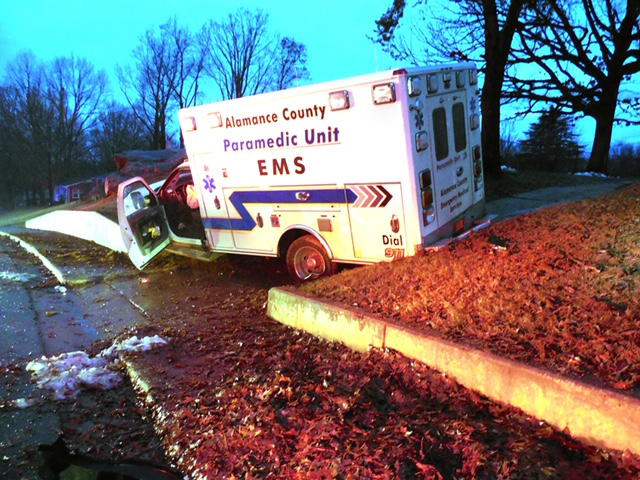 Alamance County EMS truck crashes after driver falls asleep. The driver did not sustain any injuries but the other employee was transported to Alamance Regional Medical Center for an injury, police said. Authorities said the injuries do not appear to be life-threatening. EMS responded to the scene and the street was closed for an hour because of the collision.